Web Print is the recommended method for printing to public site printers via laptops and can be accessed at any time directly through your PaperCut account. Web Print is a Web-based printing application that enables printing from your own computer without the need to install printers or to authenticate to the PaperCut server. There are, however, some limitations to printing via Web Print. You will only be able to print PDF files. If you are trying to print an MS Office file, you will need to save the file to PDF first. You may also only print a complete document; you can not mark specific pages for printing. Web Print can be convenient for your printing needs if you need to print one of these types of files quickly on a device that does not yet have public site printers installed. 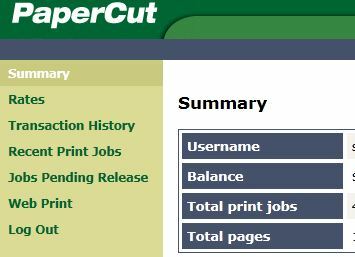 After logging into your PaperCut account (https://papercut.cc.lehigh.edu:9192/user), click the link in the left-side navigation for Web Print as shown below. Click the link to "Submit a Job". Select the printer you would like to print your job to. Proceed to "Print Options". Select the number of print copies you would like. Proceed to "Upload a Document". Browse to the appropriate document you would like to print. Click "Upload & Complete".